Camille Pissarro(1830-1903), the one of the most famous artist of impressionnism. In this oil painting, the whole scenery was organized by the bare branches of winter trees, classical country houses , fields and a farmer who is intent doing his work. The relationship between the house and the old farmer are close and balanced. Varied of gray were used in this painting. The mark on this painting is quiver which shaked slightly when Pissarro drawing on is. As we can see from this paiting, the feature object is not distinct. However the impression of the visal of the compositons are authentic. 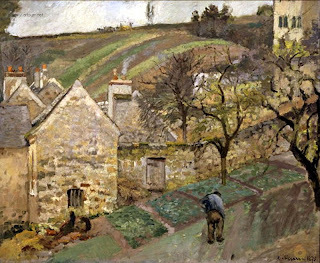 The goal of this painting, Pissarro wants to show the divine country life and scenery. This old village is not far from Pissarro's house when his family moved back to Pairs. I chose this paiting because the most interesting point that i thought is albeit there is an obvious constract of the colour between houses and trees, the whole painting is still seems peaceful and harmonious.